The Razors Shift comes stock with a wicked comfortable liner, SL heelpad, new cuff with stash pocket for the buckle, and t-nuts preinstalled in the sole. 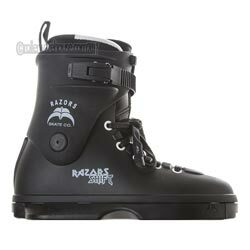 And of course, skaters can count on Razors’ legendary strength and riding performance. Razors Shift skates come with a patented instant frame changing system which allows the changing of frames and soul frame in seconds. No need to take the frame off the soul, the frame remains attached to the soul using traditional UFS mounts. Push the labeled buttons on the underside of the soul frame, using the included allen wrench or other tool for more leverage, and move the slider towards the outside. You can now easily take off the soul and frame. Align the soul and frame with the boot and firmly push the inside of the soul frame onto the boot. Make sure that all 4 ‘tongues’ are securely locked into the grooves of the boot. Guide the slider onto the outside of the boot and soulframe, tongue to groove, until the both push buttons of the soul frame pop up. Make sure that all 4 tongues are interlocking with the grooves of the boot. Shifts: Run about a half size small. These are some of the best non 3rd party liners ive felt from razors. I will say if you are an 11 and fit at the north end of a 10-11 shell they are a bit tighter than sls. All in all comfy skates though. I cant vouch for the full on sessionability of then because I only had them on for a bit, but I did wanna tell people how comfy they are.